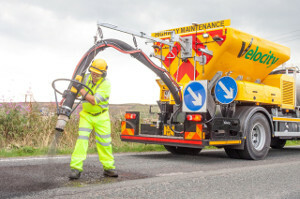 Road repair specialist Velocity has invested in new machines after what it said is a record year for its business. Two new machines have joined the company’s fleet, each with the capability to repair up to 200 potholes and other defects per day, Velocity said. Managing director Dominic Gardner said: ‘2017 was a record year for Velocity. The demand for our services has continued to grow with over 300,000 repairs already delivered in 2018. ‘The increased demand has been driven partly by the cold weather conditions in the winter, but more so by confidence in the durability and effectiveness of the product. In the Velocity process, cold applied, emulsion coated aggregate is sprayed into defects at high speed, compacting from the bottom-up and creating a seal with the existing surface. The firm said that each repair takes just two minutes, is ready for traffic immediately and costs as little as £12 per repair, compared to a national average of £52. Dave Mazurke, group manager highways maintenance at Bradford MBC said: ‘Where it’s especially good is on shallow depth defects. We’ve put it to the test and found that 10-20mm deep repairs stick where traditional repairs would eventually fail.